The atomic watch is radio-controlled to maintain the most precise time on earth, never needing to have the time nor date adjusted since it receives a low frequency radio signal that maintains it synchronized with the US atomic clock in Colorado. The built-in antenna of the watch is looking for the 60kHz radio signal of the Ft. Collins and updates its time. The radio updating process counts for Daylight Saving Time, leap years, seconds as they happen. The atomic solar watches use the photovoltaic cells (aka “solar cells”) that transform the sunlight into energy and then into electricity. The electricity power up the battery in the watch and…now you can tell time. In the case of an atomic solar digital watch, the solar panel is placed behind the crystal and the photovoltaic cells nowadays present more features than ever before. From times, stopwatch to hour in other time zones, the atomic solar digital watches are a good option to have in mind whenever in need. First thing to strike you on a watch, no matter its type, is its style and this is why the first thing to look at is the appearance of the atomic solar digital watch. You want one that fits your needs and likings, just the right size and the right color. Don’t hesitate to read and to ask around about the watch you’re planning to get, either. If you have the chance to put it on your hand, it’s great. It’s important to see how it feels on your hand, if you like its weight and pressure on your wrists. The texture and comfort of the watch are important as you don’t want to wear something that itches you all day long. An atomic solar digital watch is charging itself on solar power so you need one that is efficient even on a less sunny day or you want to go with a hybrid one that may be also changed regularly. A hybrid watch is a good idea especially if you’re not living in a sunny zone, all year long. Don’t forget about the ease of use for your watch. Putting it on and taking off has to be easy and if its clasps are tough and rigid, you may end up losing your patience when putting it on. So, take a look at the locking mechanism too as you don’t want to lose 5 minutes every single morning when putting it on. It’s no fun to go shopping on a tight budget, but this doesn’t mean you have to come back empty handed. 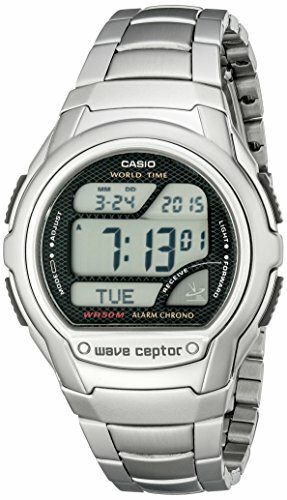 The Casio Men’s WV58DA-1AV Waveceptor Digital Atomic Sport Watch is one good example for the atomic solar digital watch that manages to be reliable and accurate, despite its low price. But the watch isn’t just that and it comes with many good features and functions that may surprise you for the buck you’re paying. A first look at it gives us a display with four asymmetrically divided small windows inside the bezel. The bezel is round and made with brushed stainless steel, taking the long time use. The central window gives you the time, and the multi-band atomic timekeeping is precise and may be set up for 29 time zones. The month and date are in the upper window, whereas in the two windows down below you can see the day of the week and the wave receptor that gets the signal. The functions are plenty: daily alarm, 1/100 second stopwatch, countdown time and EL backlight with afterglow. The stainless steel band features a fold-over clasp and a double push-button safety release. We’ve got good things to tell about the build too as the watch is water resistant up to 165ft., but also shock resistant, taking a beat. The stylish casual watch isn’t bad at all and it’s quite a nice surprise for the price you’re paying. Nevertheless, for the buck you’re paying, you get a dependable, accurate and nice looking watch that sure takes the beat. 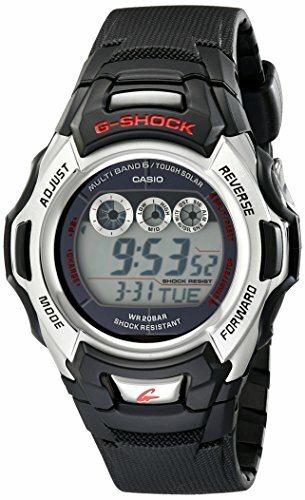 When you want to play it safe and not taking any chances but also you’re not willing to pay too much for your atomic solar digital watch, give it a go with the Casio G-Shock Atomic Solar Watch. The multi-band atomic watch gives you plenty of functions to use every day: countdown timer, 1/100 second stop watch and a full auto-calendar. You may set it for 12 or 24 hour formats and the button operation tone on/off is useful. The Full Auto EL backlight with afterglow is a nice addition, whereas the 4 daily alarms and one snooze alarm let you organize your day a lot better. The watch also features an hourly time signal and has world time function. The features make the use quite easy, so you always know the batter power level thanks to the battery power indicator, whereas the power saving function allows you longer use of the watch without the battery draining out. The watch comes with a solar rechargeable battery that has around 9 months on full charge. The construction is dependable for the heavy-duty use and not only it’s 200M water resistant, but also shock resistant, taking a fall. The digital display is easy to read and clear and the watch feels comfortable on your wrist. The wrist band is solid and the watch has a durability feel to it. Regardless of the minor issues, the watch is comfortable, reliable and long lasting which is more than enough for many of us. 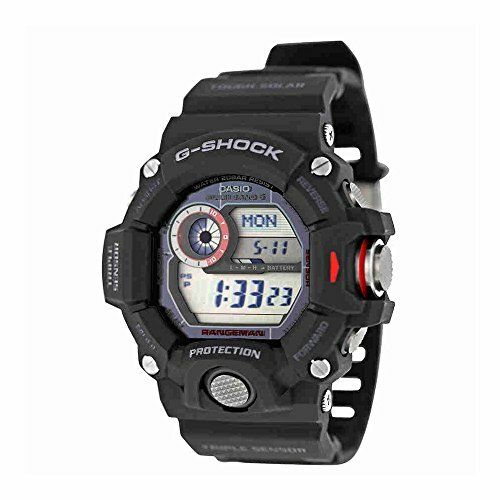 Tough and accurate, the G-Shock Men’s Tough Solar Black Resin Sport Watch is a great atomic solar digital option to consider, especially considering its price. The multi-band atomic watch comes with a tough solar power and the battery runs around 9 months on a full charge. The functions are plenty and each of them is reliable and accurate: the 1/100 second stopwatch, the elapsed time, split time, the countdown timer, the full auto-calendar and the world time in 31 time zones. The watch has both 12 and 24 hours’ formats, a battery power indicator and its power saving function is efficient. You get to set 4 daily alarms and 1 snooze alarm and the city code display or the daylight saving on/off are dependable too. The full Auto EL backlight with afterglow makes the watch easy to read at night, whereas the large display makes it easy to read every time. The build of the watch is durable and the watch is shock resistant and 656ft. water resistant too. The button is easy to push and the risk for accidental operation is minor. The band is made with long lasting resin that takes the intense use. additionally, it feels nice against the skin and the watch is comfy to wear all day long. The watch is always full and accurate and takes the use for a good amount of time. All in all, the watch is dependable, long lasting and accurate, especially considering it comes for a steal price. The more you’re willing to pay for your watch, the more you can expect when it comes to its performances and build. 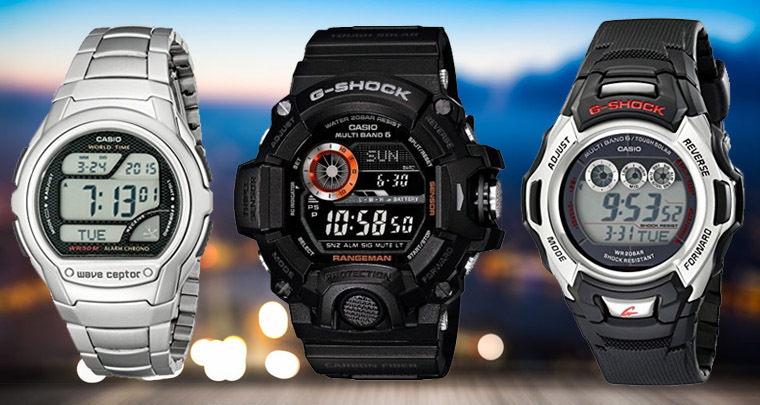 It’s the case of the Casio Men’s GW-9400-1CR Master of G Stainless Steel Solar Watch that gives you so many functions to rely on, even when hiking or backpacking into the wilderness. The solar-powered digital watch is made with stainless steel, taking so well the use for a long time, even in more difficult conditions. It features multiple displays, red contrasts and textured pushers, but it’s quite intuitive and user-friendly. The watch features a digital compass, barometer, altimeter, thermometer and they’re all very accurate. You also get to be informed on sunrise and sunset date, time stamp and you may set no less than 4 alarms. The auto LED is great for the dim lit situations, and you may use so many other functions: 1/10 second stop watch, countdown timer, and day/date/month calendar. The watch feels quite comfortable, despite its size and its buckle closure is safe. The build doesn’t disappoint either and the watch is water resistant to 660ft so you may confidently take it on a scuba trip. Not only the watch is water resistant, but it’s also tough and shock resistant, taking even a 10-meter free fall. The black resin band is also tough and easy to adjust, whereas the red/grey details make the watch not only dependable, but also nice looking. Its buttons are easy to push, the LED lumen is bright and all of its functions are precise. What’s not to like about the watch? Getting our ducks in a row, we like the watch for the reliability, accuracy, impressive list of good features and, why not, its nice appearance. 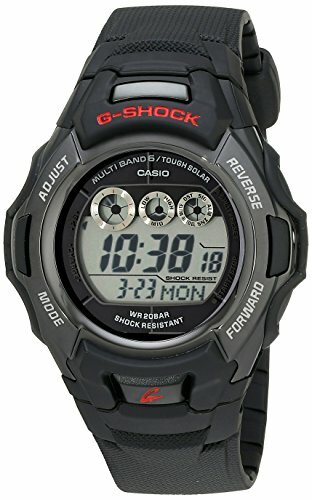 Bold and masculine, the Casio Men’s GW-9400BJ-1JF G-Shock Master of G Rangeman Digital Solar Black Carbon Fiber Insert Watch sure is more than meets the eye and its list of good features is pretty impressive. 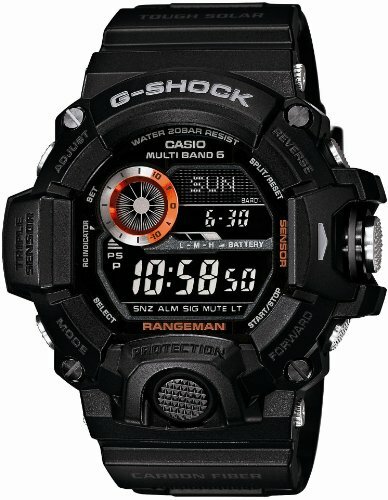 The functions are so many and accurate and you may safely depend on the watch whenever spending time in the outdoors. The watch comes with accurate barometer, altimeter and thermometer and you may use so many of its functions: countdown timer, stop watch (1/100 second measurement, 1000hours meter, split), and the hourly time signal. You may set 5 multi-alarms (with snooze function also) and check the battery level with the battery indicator. The auto-calendar is great and you may switch from 12 to 24 hours display anytime you want. The list of good things continues with the button operation tone on/off and the daylight saving time function. You get the world time in 48 cities and LED backlight makes the watch easy to read in poorly lit environments. As for the build, no comments whatsoever. The watch is ready to take a fall as it’s shock resistant and handles some splashes since it’s 20 BAR waterproof. The carbon fiber insert watch band is durable and feels comfortable too. The watch is tough and feels lighter than it appears. It’s easy to operate even with your gloves on and its masculine look seals the deal for many. Regardless of the minor issues, for the precision, nice looks and impressive build and features, you should definitely put your money at stake with this one.